Pitchers, would you wear one? The image of a pitcher hurling a baseball while wearing only a cap made of wool is as old as the game itself. But with batters getting bigger and stronger, and balls rocketing back toward the mound at faster and faster speeds, might that traditional picture soon change? High school pitcher Gunnar Sandberg (above) thinks it could. The Bay Area prepster from Marin Catholic just returned to the diamond after suffering a major head injury last spring — read more about his comeback at Cam Smith's Prep Rally — and he did so while wearing Easton's new pitching helmet. Designed to slip over a pitcher's regular cap, the helmet aims to protect the player while he or she stands just 60 feet and 6 inches away from home plate — and about 15 feet closer if we're talking about Little League. During the creation of the pitchers helmet, designers at Easton-Bell's helmet technology center — known in-house as "The Dome" — studied film of more than 5,000 pitchers from delivery to follow-through with an eye toward which parts of the head were most vulnerable to injury. The challenge was to create something that did not impede performance or weigh down a pitcher toiling under the summer sun. There is more work to be done. 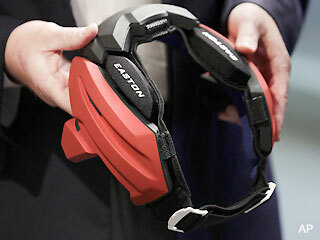 Paul Harrington, Easton-Bell's chief executive officer, said he hopes the pitchers' helmet will hit shelves this fall at a price to be determined. It's not too hard to see the pitchers helmet being widely adopted in youth or high school leagues. Perhaps it's the wise adult in me, but the helmet doesn't look bulky or even — and this might be a bigger obstacle when you're talking about kids — uncool. They actually look kind of sweet in a futuristic Super Baseball 2020 sort of way and, as Sandberg points out, wearing one is a lot better than spending months in the hospital with a head injury. Little League officials say they're already looking into it. "What we're talking about is saving kids' lives," (Little League CEO) Stephen Keener said. "These injuries are rare. When they do happen, they are very traumatic, catastrophic." If we're talking about seeing these in the major leagues, though, we're probably talking about a much longer path to being accepted. Those "Great Gazoo" batting helmets have been slow to gain approval in the bigs over the past year (David Wright(notes) was roundly mocked for wearing one) and pro ballplayers are notorious for refusing to adopt any changes that the player's union doesn't officially require. 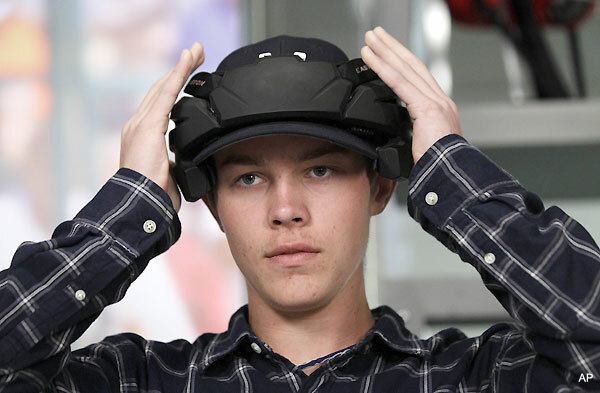 But with a 100-mph line drive reaching the rubber in less than half a second and concussions having the potential to wreak havoc on a career (see Morneau, Justin), why wouldn't you seek to put an extra layer of protection over your noggin? Unfortunately, my guess is that we'll probably have to see a head injury before we see any big league pitchers coming around to the idea of this new lid anytime soon. My only question would be at what age should it be mandatory for a pitcher to wear one. Just one pitcher getting hit in the forehead or side of the head and getting SEVERELY injured, is enough justification for me. That eerie silence that comes over an entire stadium or ball park is sickening to me. This is a great suggestion. I'm all for it and pretty sure it will be mandatory eventually after reading this. Consider me old fashioned (and I have a 12 year old who pitches), but I don't think the solution is armouring up the players - there will always be a spot open to being hit. To me the answer is getting rid of the -12 aluminum bats. I also like the intermediate sized fields (50/70 rather than 46/60) for 11 and 12 year olds. I also have a son who pitches at this level. You are so right about the field being too small, it seems like my son, who is 11 hasn't hit his growth spurt yet, but pitches to kids who are bigger than all the coaches. One of them they joke is the biggest kid in the country! He might actually be. It always scares me when he comes up to bat. This year we hear the bats make a loud whooshing sound when they do practice swing on deck. I like the idea of some kind of protection for the pitcher sitting out there at point blank range. But this thingie they have in the picture doesn't protect the "grill", doesn't getting hit in the face matter? Or am I missing something? My wife was just saying the other day that she is afraid our son will get hit while pitching. Bad things happen to good people. If it saved one kid from a major injury I am all for it. Our son hit a pitcher a couple years ago when he was 9 and it was scary. I'm with your wife! The power of our kids is amazing. I want to watch the game through a slit in the fingers of my hand covering my face. We cover our kids in prayer before every season, every game. It's really all we can do as parents. As a single Mom, I can't run out there and yell "No NO! My kid can't pitch, that 's my baby, I don't want him to get hurt". It's a team, he's going to do his part. Part of me thinks he realizes that there is always a risk he might get hit, but he's only 11, there is no real way for him to fully understand the complete and disastrous consequence of being hit in the head with a ripped ball. I don't know! I'm old fashioned. Just got back from being out of town and saw the story on this young man and the trauma the family went through. Thank God he is alive and healing and back on the field. That being said, I don't think a helmet is the answer. Get rid of the "juiced bats" and deaden the baseball and slow the speed of the batted ball. I would agree moving the pitcher and the bases back for 11 & 12's is a great idea. I guess part of what I am looking at is the "slippery slope" argument - at what point do you stop? When every player is covered with padding head to toe? We've seen face guards for batting helmets, and sternum protectors for players, all obviously worthy areas to protect, but neither was the answer. As I see it, there are two areas of concern. Number one is the bats that are lighter, livelier, and have larger sweet spots. A second, lesser concern is that players are stronger (but players will always change). Ask any player who has gone from aluminum back to wood, and they will say that the game has gotten better, and that balls are not flying as fast off the bat. That automatically will make the game much safer. Number two, I have seen some of the leagues move the pitching rubber and bases back for 11 and 12 year olds. Not only does it allow players to develop more skills (leading and pickoffs are now part of the game), but it is a more natural size for players as they grow (anyone who has watched the Little League World Series on TV can see that the players are too large for the field). It also allows a more natural progression to the full sized field, which otherwise is a huge adjustment the first year. Our 11-12 year olds plays on a 70' diamond with the rubber at 50' I will not pitch BP to these kids without a screen. Your right about the wood bats. Check out Potterbaseball.com. He does this wood bat tour during the summer for kids. It is pretty cool. metal bats have an exit speed of 8 mph faster than wood. I don't want to see kids getting hurt, and I like what the NCAA has done to deaden metal bats, but at some point you just have to accept the natural risks of the game. I actually discuss these new helmets on my blog, Minor League University. SMALLS TALK: Helmet for Pitchers? Hell yeah I'll wear one!